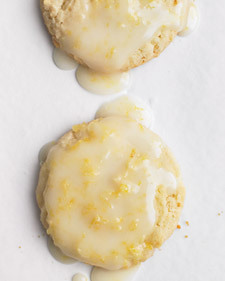 I took a break from cleaning the basement yesterday to make Glazed Lemon Cookies. These are in my top five favourite cookies. My friend Dianne's chocolate chip cookies take the #1 spot (and a batch of them helped me recently through Pablo's days in the hospital). Those look great. I'm one of those odd people who will take a lemon dessert over chocolate every day of the week. I just made a lemon buttermilk rhubarb bundt cake last week. OMG--I'm usually pretty tough on my cooking/baking but this was totally fabulous. I have my days - sometimes I crave chocolate and other days I like light fruity desserts. That bundt cake sounds YUMMY! I have the cookbook--Rustic Fruit Desserts--but here's the recipe. Thanks Collette! I will definitely have to try this real soon.